Bingo is a much mocked activity – apart from those who enjoy it, for whom it is very rightly a cherished oasis of distraction, excitement and socialising. It remains a staple of many hospital activity programmes, particularly for older patients, and we’d like to warmly endorse this. Studies of elderly people in care homes have shown bingo is indeed beneficial and other research even demonstrates the positive effects of bingo on the brain; it has been shown that people of all ages can be helped to maintain optimal brain function through playing bingo. It has even been proved by Princeton University to help with short-term memory loss in people with Alzheimer’s. And while we’re at it, we’re going to add in the Joy of Jigsaws, as doing a jigsaw provides many of the satisfactions that bingo gives people, not least an escape from troubling thoughts. ‘Flow’ – in the sense of getting totally taken up by an activity so that time flows, or flies. Unpressurising because players can’t influence process and outcome. No self-judgement, or decision-making required. Can be passive yet engaged. Optimistic. Each card has equal chance of winning and each new game is a fresh chance to succeed. Jigsaws are brilliant, and without wishing to over-therapise a simple leisure pleasure, they provide a wealth of recovery-building skills. Patients can dabble for a few minutes or even seconds, or spend whole days attaching ears to Dalmatians and roses to cottages. Jigsaws can be solo or group endeavours. Distracting myself with a jigsaw, helped with my anxiety and I started to find it very absorbing. 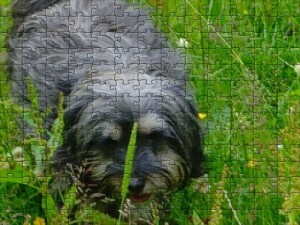 If I can’t sleep I do jigsaw puzzles. I love doing jigsaws and it’s one of very few activities I can do when I’m in a pretty bad state. The mass of pieces begin as a complete mess. It looks impossible to rearrange into anything coherent. But. Reassuringly, there’s a system for starting to work it out – doing the edges, defining the parameters. You can then continue the ‘chunking’ or baby steps or task analysis or breaking the task down by grouping pieces by colour or other content. Having sorted out and slotted in the easier pieces, the daunting can be left for later.Pieces which look like they couldn’t possibly be connected can turn out to be the right combination – the improbable is possible! It takes cognitive effort and dexterity to twiddle pieces around so that they are the right way up, one of several facets of it being a perfect exercise in seeing things from different perspectives.Only when the jigsaw is complete can some of the details become apparent, a good reminder that it’s inadvisable to make assumptions before the whole picture is available.The experience of doing a jigsaw is totally absorbing. The whole ‘flow’ thing described by Csíkszentmihályi, and easier to pronounce than his name. This blocks out other thoughts, squashes other feelings. It’s deeply, continuously fulfilling, as the picture starts to form and pieces start to fit together. Online jigsaws (eg jigzone.com) have the additional satisfaction of the sound of each piece clunking into another. And of course when it’s completed, there’s the great sense of resolution and achievement.